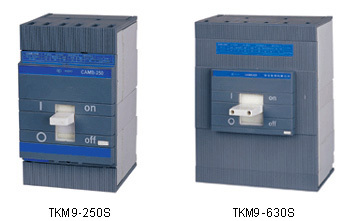 ● TKM9 series molded case circuit breaker is applicable circuit of AC 50Hz (or 60Hz), rated insulation Voltage 660V, rated operating Voltage underAC 660V, 250V(DC), rated operating current 10A-800A, for distribute energy of electricity and infrequent making and breaking circuit, in normal conditions. ● The MCCB rated current under 400A ,They are provided with the function of the protection against overload and short circuit and undervoltage. The MCCB complies with standard of IEC 947-2, GB14048.2, GB14048.4 and so on. 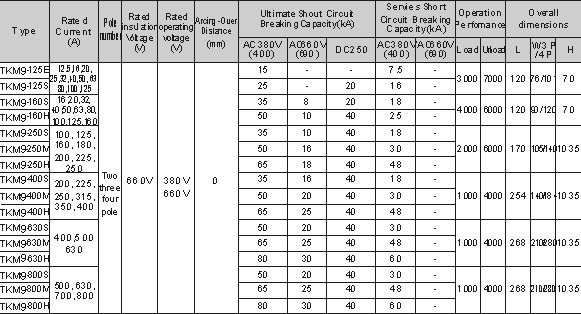 ● The thermodynamic release of the breaker has the advantages of inversing time-delay while the instantaneous operation as shown on table 1 (distribation circuit breaker) and table 2 (motor protection circuit breaker).